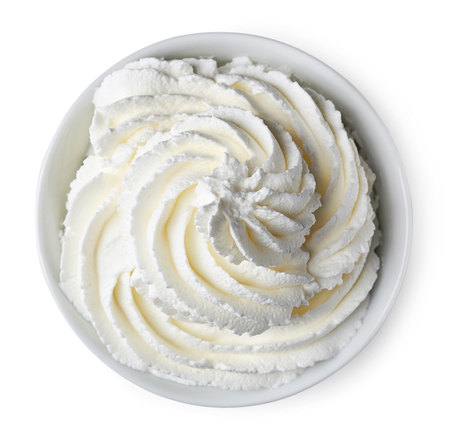 Cream is the fat layer that forms on top of unhomogenised milk. This fat layer is then skimmed off. Cream has numerous culinary uses. You can add it to soups and sauces to give a smooth, rich texture. It’s also commonly used in desserts either incorporated within the dish or added as whipped cream, or simply poured over – especially on fruit, puddings, or tarts. Apple pie is a great favourite to have with cream poured over. It’s important to choose the right type of cream for the purpose, but with all the various types of cream – and the fact that the terms vary between countries – it’s easy to get confused about which type of cream you need to be using. See below for more information. Our sister site, Not Delia, has a lot of information about cream. There’s also information on Not Delia about how British cream terms compare with others.